I looked up today's weather and saw it was going to be 18 degrees in Jasper today. I definitely got overexcited and decided to wear sneakers instead of boots today. Stupid decision considering we were going up the Jasper tramway this morning. It took us up to over 2000m where it was -2 degrees. Luckily our coats were in the car and we had those with us. The tramway goes up Whistlers Mountain which takes it name from the marmots who live up there. They communicate by making a whistling noise hence their nickname 'the whistler's. The view from the top was beautiful. We looked down over Jasper with mountains as far as you could see. It was like looking at an oil painting. They just didn't look real. There had been a snow fall up there earlier this week and there was still some lying around. The wind was icy. We could see lakes and rivers easily and could see the ones fed by glaciers by their green or blue colour. We spent about 30mins up there on the mountain before catching the tramway back down. We headed back along the Icefields Parkway to the turn off to Mt Edith Cavell. We turned onto a very narrow, very steep, very windy road and climbed for 14kms. Once parked, we had to walk a steep narrow trail up to a point where we could overlook the Edith Cavell glacier which was at the end of Edith Pond. This is a tide line glacier meaning it touches the water. Above us on the mountain was the Angel glacier which is a hanging glacier. You can see in the photo that there are distinct layers in the glacier. Each snowfall is compacted down and then a layer of dirt covers it from landslides. The pond was full of icebergs and seemed to be frozen over in parts. 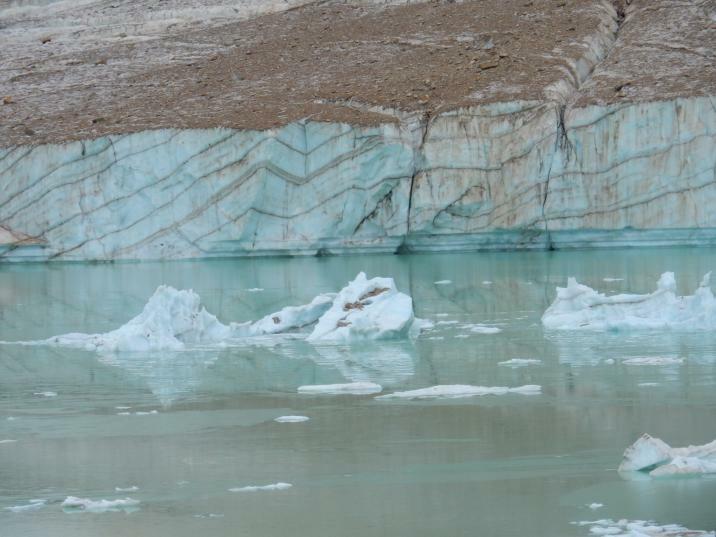 We sat and watched it for an hour hoping to see a calving which is when part of the glacier just falls off. We saw it in Glacier Bay when we were on the boat. It sounded like thunder. The ranger on the boat told us it usually happens 3 times an hour. Edith rumbled a few times but there was no calving. It was getting colder and started to rain so an hour up there was enough. When we came back down, we spent the afternoon walking around Jasper. It is a really cute town. We skipped lunch and had afternoon tea at the Bear Paw Bakery. The first time we came to Canada we discovered the Nanaimo bar which is a biscuit base with a creamy filling topped with chocolate. They are delish! Internet is very unstable again tonight but I will try and fill in a bit more from yesterday. The Icefields Parkway is considered to be one if the world's most scenic drives. It is lovely. There are postcard images of mountains and lakes. The only thing I didn't like was the 90km speed limit. It was too fast to take all the scenery in as well as look for wildlife. It was good when there was no traffic behind us and we could slow down a bit. I am very glad we had the Gypsy Guide. He told us a lot of the geological history and about the explorers and mountaineers who first crossed these mountains. He also told us which things to stop at, what was a 'don't miss' or 'stop if you have time'. He also told us how far the lake or lookout etc was from the car park and if it was a flat walk or a steep walk. He was very useful! Just over halfway is the Columbia Icefield. Most of the Icefield is hidden from view behind a mountain range but the Athabasca Glacier was in full view. We did the tour which took us in a special ice explorer bus onto the glacier. We were then free to walk around on a part of it and could even fill up water bottles with glacier water. It was cold out on the ice but a great experience. The ice beneath us was over 240m thick. We had to stop for 2 big horned sheep on the road and we saw a mountain goat but that is all the wildlife we have seen. So many if the hiking trails around Lake Louise and Jasper have signs warning of high grizzly bear activity. When those signs are out, the law states you can only hike if there is a group of at least 4 people. There are a lot of Elk around Jasper and signs are out saying the bulls are dangerous. I thought we would have seen something but nothing as yet. Tomorrow we drive to Whistler.